I experimented on a glass candy dish and plain glass ornaments, I think they turned out awesome- is it Christmas time yet?! I did this project around the time we were working on our farm table. Chalkboard stuff is ALL over Pinterest, so I generated a lot of my ideas there. I just used simple chalkboard paint from Lowe’s, as well as white oil based paint that we used on the table. The best part was using a projector to put up my design and copy onto the board. I do NOT have steady hands or any talent at free-handing so that was really the key. Here are the pictures of the tank stand we built to hold our 90 gallon salt water aquarium with a 40 gallon refugium underneath. We have been in the process of moving this past week and are just now sort of getting settled back in. Today I redid our bottle cap coffee table and am really happy with how it turned out! I have almost all my Christmas presents bought, so I finally started wrapping them. I found these awesome gift tags online and they turned out great! All you have to do is download the pdf, fill in your recipients and print it off on cardstock. Had a relaxing couple days back home with wonderful food thanks to mom, our traditional Christmas tree decorating and some down time with Addie and a good book! Last year I made my first no-sew fleece blanket for the boyfriend, and it’s become *my* favorite around the house, surprise surprise! A long time ago I made one with the traditional ties on the edges, but the fringe just doesn’t wash very well and last as long as I’d like so I went for a different method. Some call it crochet edges, it’s just a continual pull through of the fringe. Another thing different about these is that they don’t lay perfectly flat (or at least mine don’t). You can make them lay flat, or curve up along the edges, which I prefer. No one likes cold toes, and the big versions of these blankets pretty much wrap themselves around you. For this project I made the blankets to use for Addie’s dog bed covers. So, once again the “hugging” edges were perfect to go around the top and edges of her nest shaped bed. The bed is super comfy for her and a great size, but it just gets dirty and icky super fast. This way I can throw one of these on, flip it over when needed, then throw it in the wash and replace with another! Here are the pictures with some instructions, I hope they’re clear enough to follow! For these I only needed 1 yard fabric for each blanket. One yard will make a blanket approximately 32 inches x 24 inches with the scrap trimmed off. First lay the two pieces of fabric squarely on top of each other with the sides you want showing on the outsides. One of the main things you will need to make sure this goes smoothly is a nice sharp pair of fabric scissors, it makes all the difference! In each corner I cut out a 2 inch by 2 inch square. Leave the last two fringe on one side un-slit. Then you can start (right after the two you left un-slit), placing one fringe through the hole of the one next to it, and repeating all the way around til you reach the end. It helps to tug on each fringe once you’ve pulled it through to get a flat edge. On this pink blanket I cut the slits in each fringe up higher to the middle of the fabric, this causes the edges to curl in more than if you cut the slit closer to the bottom of the fringe. All covered up and ready to go! I really like how it’s held up, I have to wash it all the time. Plus, the contrasting black fabric on the underside really makes the edges stand out nicely! It was super easy, I just made sure the antlers/skull were clean and dry and started painting. The paint covered really easily too, it only took 2-3 time to coat the whole thing evenly. Christmas time is getting closer, so it’s time to start my gift crafting projects! Here is one of quite a few of these I’ll be making this week. I just used 8 inch wide pine boards and estimated how long they’d need to be for the amount of letters. This time around I used brush on instead of spray paint- it’s actually much quicker and easier to do touchups this way. Just like in my other sign project, I printed out the words and heavily traced over them to create a stencil on the board once it was painted. This sign took 3 coats of white paint, I think because the letters are so large. So my bedroom is in serious need of some decor help.. what better than a cute sign? I got this junky piece of wood, that was kind of an awkward shape but smooth and square, perfect for a sign! Being a horrible decision maker… deciding on a quote was the biggest feat of the whole project. I’ve had this one saved awhile, and thought it’d be perfect. The lettering I spaced out on Microsoft Word and laid out before hand. I used matte spray paint, and just used one full can. Once it was painted the navy blue, I taped the words together and set them on top how I wanted them to go. Easy enough, I just traced over the outline of the letters with a ball point pen and with a little extra pressure I ended up with a perfect stencil. I can probably blame Pinterest for this, but I’ve been wanting to try growing succulents for awhile. They seem easy, and they are so pretty! I ordered 25 cuttings from a great shop on Etsy: Succulent Salon. We will be building a planter this weekend, so for the time being these are their new homes! Now is when I cross my fingers and hope I don’t royally mess this up! As much as I know Addie wants to steal all these random deer antlers I’ve accumulated recently for her own chew toys, I’ve had a lot of fun crafting with them. Unfortunately I don’t have any before pictures, I was too anxious to clean it up and get to painting :/ They came from my parent’s cabin, my dad tells me they are from an old Mule deer. I used a mixture of maroon beads (Whoop! ), black circular tile/beads, pearls, and some random red/maroon seed beads. I used white tile adhesive for my background on the skull, using only my fingers and a plastic spoon when necessary for the smaller corners and crevices. 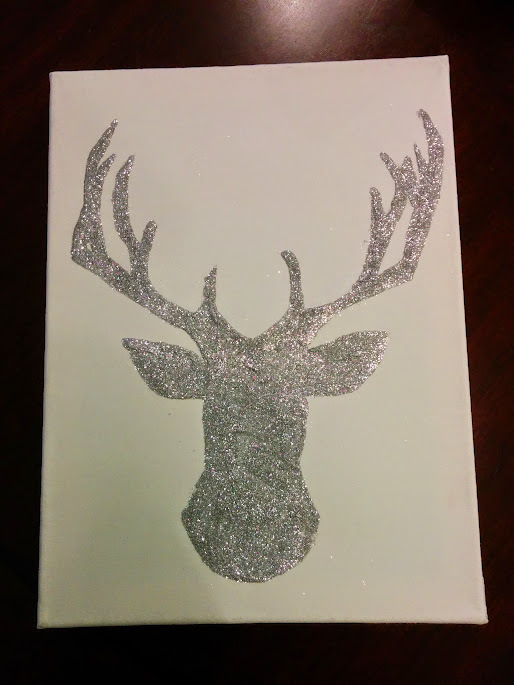 I spray painted the entire thing, antlers, skull, and plaque and finished it with a clear coat. There are a lot more angles to fill in with spray paint than you would think.. I still wouldn’t have wanted to hand paint it though- I feel like the brush strokes would have hidden the surface detail of real antlers. Here is the final product, much darker and more “maroon” in person. Oh, and beware- if ever working with real deer antlers? Their heads aren’t always symmetrical, we had to shift this one’s skull on the plaque just to make it appear more level- it’s going on a wall after all! Mine happened to have one antler going “up” and one “out”. 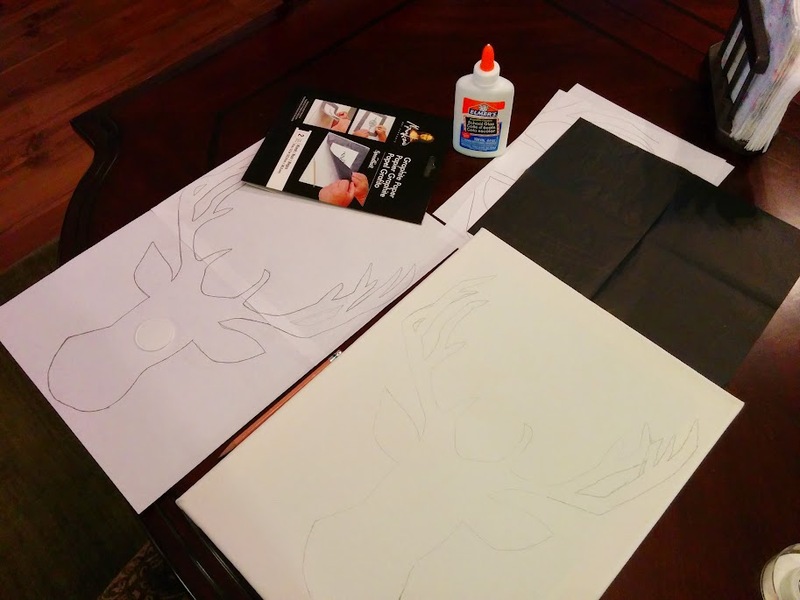 Anyways, on to the next antler project! This is a post just to chronicle the process of making our bottlecap coffee table. We kept an eye on the local Craigslist for quite awhile, and finally found this table for $40 I think. It had an extra piece of glass as well, which was nice. The first thing we did was dismantle the entire thing and start painting. Well even before that a whole bunch of sanding was involved.. (I think I like to pretend that part never happens because I dislike it so much- one of these days I’ll own an electric sander…) Anyway! The base and top circle were hand brushed with high gloss black paint, and the metal legs and rings were spray painted a dark gray, almost black hammered finish. We decided to add a piece of plywood for the bottle cap platform, mounted right under the top circle the glass sets in. Once that was screwed in place I filled in the edges with wood glue to make a cohesive edge all around and then painted it black as well. I should have counted how many bottle caps I ended up using, but all I know is it seemed to take *forever*. We ended up testing out the most random beers, just because I wanted their pretty lids… Anyway, the most difficult part was aligning them in a way there weren’t obvious gaps and holes. I originally wanted to bar top the table- fill it in with acrylic- but I like the fact that I can remove the top and rearrange the caps at any time. Right now it has A&M across the middle, with the caps randomly groups around it. Soon I think I’m going to change it to a more swirling pattern. Because I do have groups of caps I’d like to use them in a continuous way instead of just completely random. The pictures for this aren’t as organized as usual, as they were just taken at random times throughout the process.